Bangladesh Puppet Research and Development Centre was launched on Friday with the staging of three puppet productions at Studio Theatre Hall of Bangladesh Shilpakala Academy. The troupe staged Kupakat, Nak Kata Raja O Tuntuni and Ekti Janaika Garur Shakkhatkar. 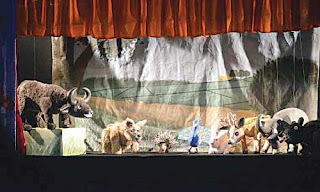 All three productions taken from popular children stories delivered moral teachings following traditional puppetry style. Kupakat, a popular children story by the martyr intellectual Munier Chowdhury, depicts how a tiny hare defeats a ferocious tiger by intelligence while Nak Kkata Raja O Tuntuni, adapted from stories by Upendrakishore Roy and Jasimuddin, delivers the message, through interactions between a king and a bird, that plotting harm against others may backfire on the plotter. The last production Ekti Janaiko Garur Sakkhatkar has been adapted from a satire published in a national daily. Jahangirnagar University’s drama and dramatics department students worked as the puppeteers, lent voices and played instruments in the productions. Haroon also said that the aim of forming the centre was to save the nearly extinct traditional puppetry, which was once a very popular entertaining performing art in the rural Bengal. 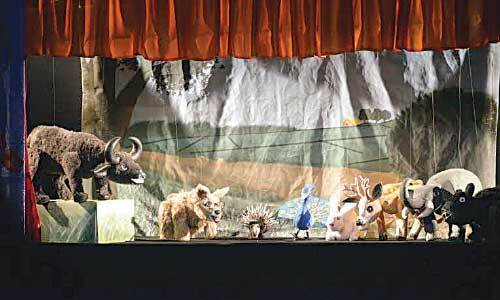 ‘Even decades ago, there were many puppetry troupes in the country. But the puppeteers are switching to other professions as the art form lost popularity,’ he said. Bangladesh Shilpakala Academy’s director general Liaquat Ali Lucky and Bangla Academy’s director general Shamsuzzaman Khan were also present at the launching ceremony. Both of them lamented the disappearance of many traditional art forms like puppetry and shared their plans to preserve and protect those.